Meet Spirit aka “The Pupster”, the Thompson family dog. 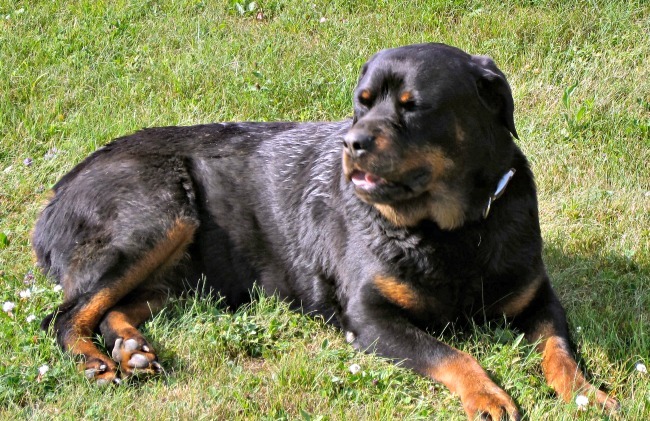 Yes, she’s a Rottweiler and they are a very misunderstood breed of dog. Over the years they have gotten a bad reputation as being aggressive and untrustworthy but Spirit’s just the biggest cuddle puppy you’ll ever meet. She’s sweet, gentle and loves being with us no matter what we’re doing, be it camping, hiking, gardening, or just hanging out. She’s the protector of our flock of chickens keeping them safe from the coyotes, raccoons, and eagles that would love to turn them into a chicken dinner. Spirit’s the best buddy to our cat CJ, who tends to be a little neurotic and paranoid when he goes outside. CJ’s confidence seems to be bolstered when she’s with him on his outdoor adventures. Waiting for the UPS driver to deliver her new Tall Tails® dog bed and of course, a dog biscuit. One of her favorite summer pastimes is hanging out on the front porch. She loves the vantage point so she won’t miss the UPS truck when it comes. The driver always has a dog biscuit for her and she looks forward to greeting him when he makes a delivery. She alerts the minute she hears him coming down our long driveway and is waiting to greet him the minute he opens the door of the truck. He always has time to stop and give Spirit a biscuit and a pat, and if by chance she’s not there, he always asks where she is. Today he delivered her new dog bed from Tall Tails®. 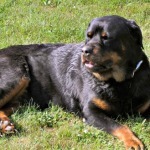 They’re a company that manufactures a variety of pet products, including durable towels, warm blankets and supportive beds for dogs to help dogs stay energized for the adventures that lie ahead. Every product is machine washable and dryable, to help maintain a clean and healthy environment for our beloved pets. Love this dog bed, and I know Spirit is going to love it too! It is easily folded for ease of carrying so we can move from place to place. It will nicely in the back of our Jeep Wrangler giving her a comfy spot to lay. I finished unwrapping it, and had to leave the room for a moment. 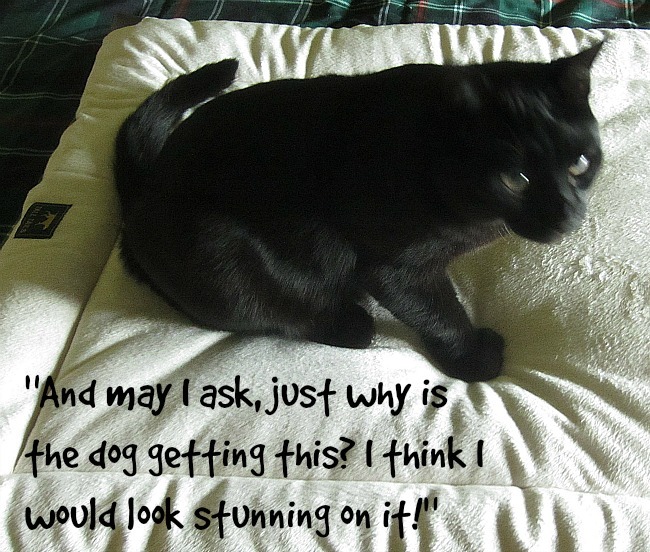 I came back to find Chuckles the cat checking out Spirit’s new Tall Tails® dog bed. He was looking like he was really liking it and was very disgusted when I pushed him aside to take it out on the porch for Spirit to try out. 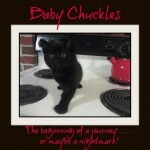 Mr. Chuckles was not a happy kitty when he found out that this bed wasn’t for him!! The family was going to spend a little time on the back porch barbecuing, where we have the picnic table and the barbecue grill set up. Like most dogs, Spirit wants to be right with you, especially if there is food involved. The bed gave her a nice soft place to lay rather than on the pine wood floor. with A face only a mother could love! Spirit is enjoying her new comfy Tall Tails® dog bed on the back porch. She can be comfy and be with the family. She’s loving it!!! 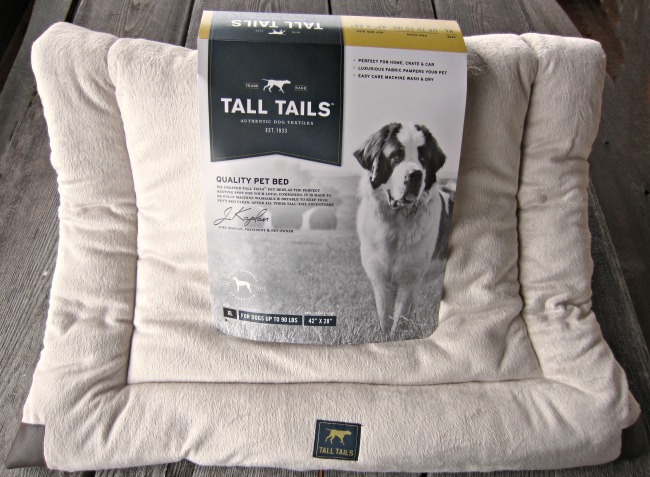 The Tall Tails® dog beds come in four sizes to accommodate a wide range of breeds. Spirit is a very large dog so she has the XL size. Chuckles the Cat feels he could have gone with the Small. The bed is machine washable and can be tumble dried on the low setting. The reversible sides offer a warm cuddly side shown in the pics with Chuckles and Spirit, and an olive green canvas side that would be more comfortable in warm weather. Tall Tails® is a wonderful company. From donating beds for military dogs, to supplying warm blankets for hard charging dogsled teams, the folks at Tall Tails believe every dog needs a place to rest before and after each adventure. 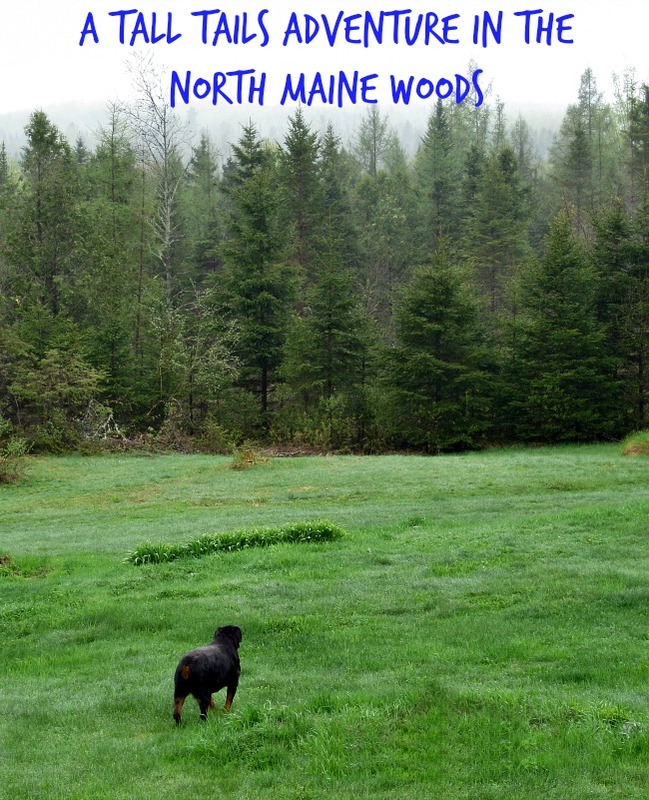 They believe that dogs are happiest when they are sniffing out new adventures in the great outdoors. Dogs love to get outdoors and get active! Be sure to tell us recent stories and photos of family adventures that got your dog’s tail wagging in our comment section. Spirit had a nice nap before she set out to patrol the farm for predators on a rainy afternoon which is a daily adventure that keeps her in great shape both physically and mentally. We are so fortunate to live in such a remote area where we can give her freedom. Spirit takes her work seriously as protector of the farm and family. She’s heading out on one of her “patrols” to make sure that the coyotes, bears, eagles, and raccoons don’t venture into our farm. Living on the edge of the wilderness makes predators a constant problem. 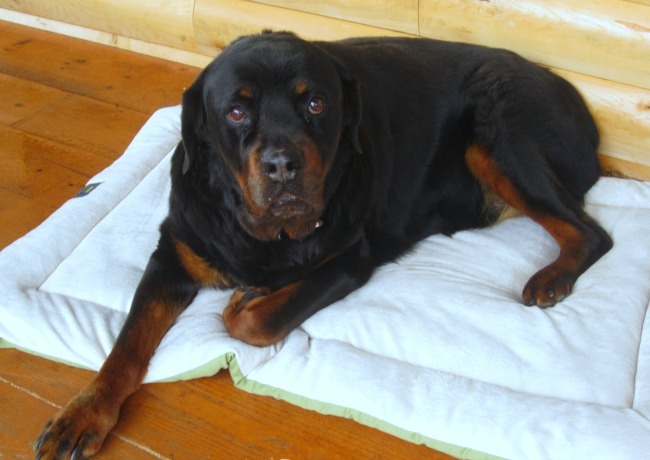 Would your pup enjoy a comfy bed to curl up on after an outdoor adventure? Enter below to win one for your adventuresome best friend. 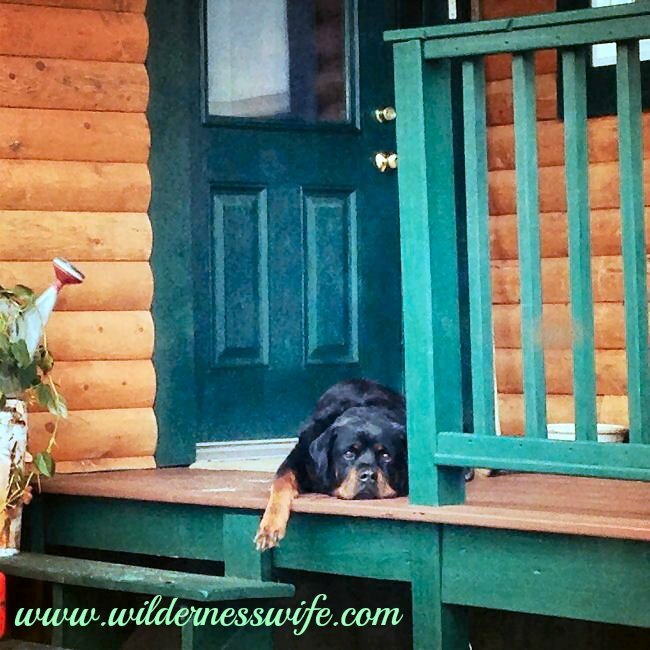 Adorable – that picture on the porch is priceless!! My Rottie would love this, too!! Thanks for the chance!